I always feel like I'm derelict in my duties when I do a non-design post like my PSA on the flu this morning. So here's a topical quickie, stolen shamelessly from the pages of Real Simple magazine's website. I rarely have any use for that magazine or the idea that I need to pay someone to tell me to get rid of all my crap so I can replace it with more crap that costs more money but takes up less space. Why not just get rid of my crap and not replace it with anything? Hmmmm. 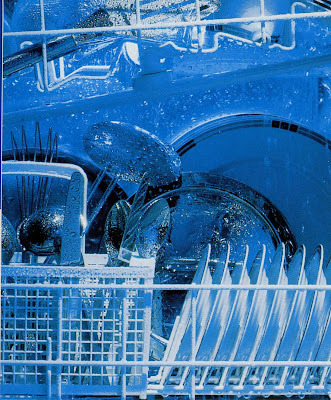 Anyhow, here's their list of dishwasher fun facts. Baseball caps can get bent in the washing machine but hold their shape in the dishwasher. Don’t wash them with dishes; food can get trapped in the fabric. Wooden cutting boards can swell and contract, leaving them teetery and essentially useless on a counter. Most bamboo boards are susceptible, too. Why you would: It’s the only way to get them clean. If you're so inclined: Shake loose dust into the trash first, says Shannon Lowe, the Tulsa-based author of the blog rocksinmydryer.typepad.com. Stick brushes and attachments in the silverware basket and broom ends and dust pans on top. Why we wouldn't: We don’t believe in Santa Claus or unicorns, either. If you're so inclined: Place the keyboard facedown on the top rack, don’t use detergent, and skip the drying cycle. Afterward, unscrew the back, if possible, or pop off the keys (take a picture beforehand so you remember where they go). Air-dry two to five days. Pray the Computer Fairy is looking down on you, then reassemble. Why you would: Because it’s an Internet cliché that happens to work. Impress friends! Make kids laugh! Why we wouldn't: Our food editors tested this “recipe,” and though the fish did cook, the dishwasher reeked afterward (shocker). Plus, you’re actually cooking the salmon with your crusty dishes and coffee-stained mugs. I'm surprised that they haven't added 'dentures'. Before you ask, no I haven't and no I don't have any ! What a great idea! Thanks for checking in from Luxembourg. Oh! From the sound of things, I will be in Italy again in the beginning of summer this year. If the stars align I will make it back down to Positano. I'm telling you, just the thought of it warms my heart. Out of sheer laziness, I often wash cutting boards, wooden spoons and my pizza stone in the DW and have never had any problems even though I've been told not to. I like the idea for washing potatoes for a large crowd. Might come in handy with the holiday season upon us. After reading this, I wonder how many people consider that it is important to clean the dishwasher itself once in awhile. I love it! But honestly, you took my blog idea for off-label uses of dishwashers. I've been compiling ideas for a roundup. Had the potato one, but how about filling a dish drawer with ice to make a beverage cooler for entertaining? Great post! I do the same thing with cutting boards and wooden spoons. I'm always surprised by how few people actually clean out their dishwashers. It doesn't take much to rinse out the gunk screens at the bottom of one at the very least. All I did was steal Real Simple's. Have at it! One that gets overlooked a lot is the ability of a dishwasher to sanitize kids' toys. With flu season upon us, it a good thing to know. Angela, welcome to Kitchen and Residential design and thanks for your comment. I just read your profile and I have to tell you that "A Journey into Michaelangelo's Rome" sounds like an amazing work. If it involves the great city of Roma, I am all about it. Send me a link to your book! Good lord, I'd have never thought of most of these! Particularly cooking salmon that way. Who on earth comes up with this stuff? I'd like to know the answer to that one too Wendy. I'd imagine that a lot of it comes from the manufacturer's testing labs. Product developers and industrial engineers are a pretty fun bunch and I can imagine that they play around a lot with their creations. Marketing departments love to make hay from the engineers' hijinks.